Take a stroll down memory lane as we look back at the best from Advantage and our partners in 2017! Happy New Year from the Advantage Companies. 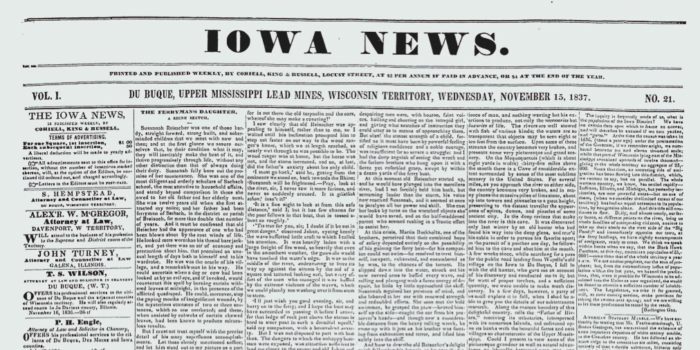 2017 kicked off with Advantage and the State Historical Society of Iowa unveiling a new plan to preserve more than 12 million pages of newspapers in its collection, giving Iowans greater access to more than 300 titles dating to the state’s pioneer days in the 1830s. In August, the Cedar Rapids Public Library announced it’s partnership with The Cedar Rapids Gazette and the Advantage Companies to digitize past issues of The Gazette from 1857 through the present day. A directory of the Advantage Pre servation hosted Community History Archives was made available online! You can now search historical newspapers from over 450 different collections in 38 different states. See how you can “Get Involved” in preserving your community’s history. If you are interested in helping to ensure that your community’s recent history is preserved for future generations visit our Get Involved page and contact us today! An exciting development for the IAHistory Project in 2018 as Advantage will work with 13 community libraries in Southeastern Iowa to audit, preserve, and digitize nearly 165 years of archived newspapers for all of Washington County. It has been an exciting and eventful year for Advantage in 2017 and we are truly thankful for our partners and the communities we have worked with this year.